There has been something on my mind, bugging me for a few months - well not bugging me. You see, my livelihood is tied directly to Managed Print Services as an MPS Practice Manager. Interesting little tidbit, 12 months ago I was selling MPS - today I am responsible for the full P/L. Everything from hiring technicians, hiring MPS Selling Professionals, forging and maintaining MPS partnerships, building an MPS team. Continuously, every-single-day, selling MPS internally to other practice managers, Business Development Managers, Executive management and Ownership. And as I continue on this particular odyssey, it is my responsibility to evaluate all things MPS; new and interesting Data Collection software, EAutomate Add-ons, supplies fulfillment programs, devices, OEM MPS Programs, etc. I attend as many MPS Webinars and read/consume every article I can find - from MPS to Change Management to EDM to ECM to BPO. I try to get as much exposure to every MPS Selling webinar, class or program I can find. The results of this analysis can fill a dozen manuals - perhaps someday I will put my findings in "print". All this accumulated information, I apply were relevant in my little MPS practice. My point here is simple - although I know a good deal about MPS and the internal MPS programs, I do not make a living pontificating or selling training classes. I do not compete with the likes of Water, or Print Management Solutions Group. And even though I feel I have an above average understanding of the global MPS market, my research does not go toe to toe with the likes of InfoTrends, IDC, or Photizo. Is this blog followed by many people of like opinions? Yes. Do I see bad training, stunted vision and archaic selling techniques? Yes. Will I continue to point out blaring inadequacies in our industry? Yes. You see, I own "THEdeathofthecopier.com" - they own "deathofthecopier.com" subtle but you get the point. They are hoping to get peeps who accidentally look for me without the "the". Further research shows that SD purchased "deathofthecopier.com" toward the end of this summer and has that domain pointed back to their site. Now why in the world would an established authority feel compelled to piggy-back a young upstart, a Defiant One, like me? I am somewhat fond of a few of the seminars that Strategy Development conducts. They have some effective videos on YouTube, a solid understanding of "back-room" operations - and a strong copier pedigree. Whatever the hell that's worth. And they fill class rooms. They make money, filling class rooms, speaking on behalf of OEM's and presenting at old-skool conferences - bully for them. After the fourth reader emailed me, alerting me to this tomfoolery, I felt it necessary to respond, settle the misconception and clear the air. Strategy Development is not the training wing for DOTC and has not been contracted by DOTC. Strategy Development does not work for TheDeathOfTheCopier. But who knows what the future may bring. It is a bit flattering, I guess. Perhaps more pitiful and sad. "...Now let’s fast forward twenty years. That tire changer, who flunked high school biology, has a blog titled “DeathoftheDoctor” and espouses his opinion on medical issues. He never really says anything with any substance, rather he just attacks anybody else that does and uses pithy phrases to indicate they are fools. Eventually, those “fools” begin to disappear from the blog since they didn’t sign-up to get berated and the only posters left are the real fool, your high school biology failure, and a small group of other flunkies who agree with this unqualified guy giving out medical advice. The internet, self promotion, and lack of substance have elevated this guy—mostly in his mind because let’s face it he still goes to the tire shop each day—into some type of cult guru..."
This guy has got a real 'jones' for me, eh? Ok...well...I know there are hundreds of "DeathOfThe..." blogs around. I did pass High School Biology, and I do not consider my MPS colleagues "flunkies". So they can't be referring to me...right? I mean, why would a real "doctor" buy deathofthedoctor.com, if the tire-guy lacks "substance"? What in the world does the doctor have to fear from him? Ok, it is sad, isn't it? Back in Detroit, we have the Iron Fist of the Brown Bomber. Not quite as flamboyant or maybe not even as well known as "Rocky". But he is real, not a poser. 2010 is over - 2011 looms. The seasonal opportunity for burying hatchets and moving forward upon us. Fortunately, I have plenty of hatchets. just remember Greg..its hard out here for a pimp. I enjoyed your post, and will reserve my comments on the MPS "establishment", whatever that means. MPS is something I love and have participated in for 7 years, however the market is so watered down right now with experts... can we really drink Perrier and believe it's Moet? Or Thunderbird..whatever you are into. Cybersquatters sometimes register variants of popular trademarked names, a practice known as typosquatting (aka URL hijacking), which is a form of cybersquatting relying on mistakes such as typographical errors made by Internet users when inputting a website address into a web browser. The Anticybersquatting Consumer Protection Act (ACPA), 15 U.S.C. § 1125(d), is an American law enacted in 1999 and established a cause of action for registering, trafficking in, or using a domain name confusingly similar to, or dilutive of, a trademark or personal name. 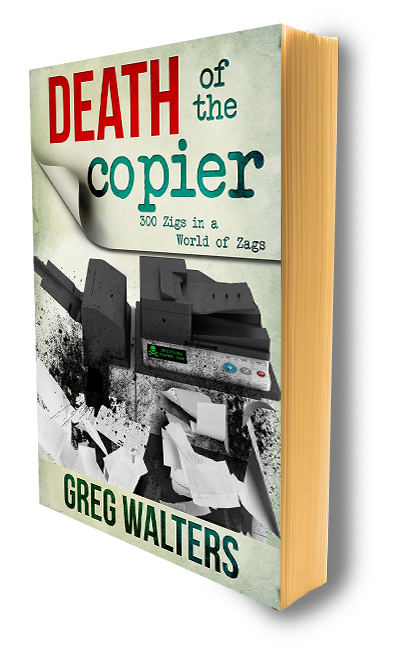 I just bought thedeathofthecopier.ORG but I'm using it to sell cleaning products. I know what you're thinking, but this is not a pyramid scheme. There are charts. Charts! Well, it must be legit.